One of the best ways to get a kid to take a bath is to have some great toys in the tub, like this Alligator Family Bath Toy, to give them some bath time motivation. This Mama gator and her three babies can also be pals in the pool this summer. The flat back of the mother is a perfect platform for the babies to ride. Durable for hours of watery fun. 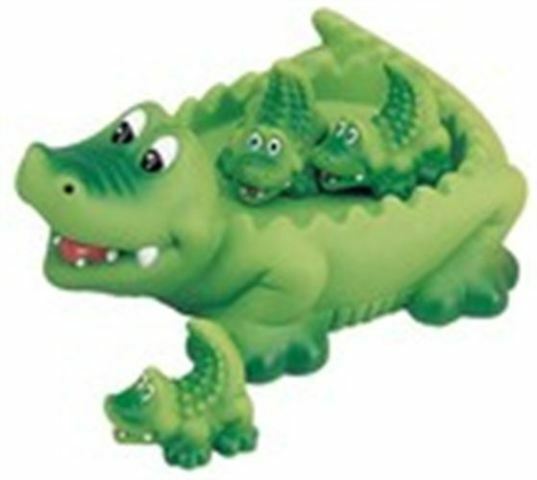 Made of soft plastic with no small pieces or sharp edges so these gators are safe for you little ones. It's floating fun for everyone. Recommended for children 3 and up. For more information or to order, click here.